Ask, Seek, Knock. – The Sun Shineth again! What is it that troubles your mind? What is it that gives you sleepless night? What is it that you’re so tirelessly worried about? Is it finance? Relationship? Family? Career? Education? Health? 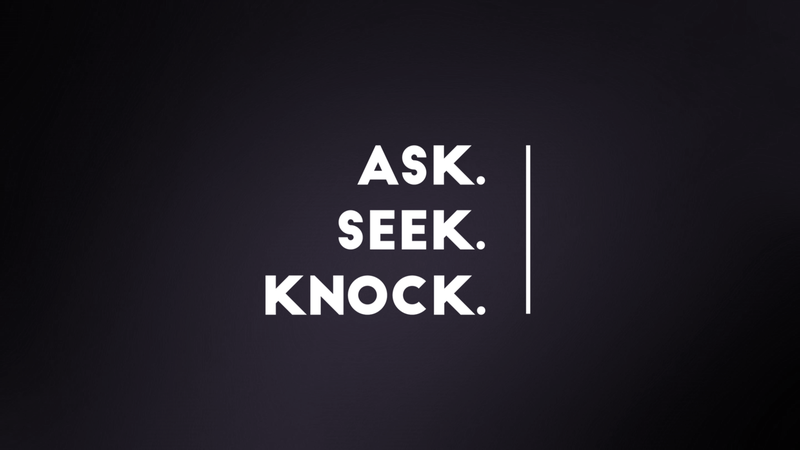 Whatever it is, ask, seek, and knock. The Word assures you that surely, you’ll receive when you ask. God is not man that He should lie. He is one who speaks and it never returns to Him void. His word are YES and AMEN…and sometimes NOT YET and WAIT. Nonetheless, He ALWAYS come through with His promises. There are troubles of the heart that can’t be shared even with loved ones, and personal battles that you may think to be to “disappointing” or “embarrassing” to share. Take it to the Lord in prayer. Our God is not a judgmental God. He is also not a snitch, so don’t worry, He won’t tell on you. His outstretched arm awaits your presence. He is readily available, patiently waiting for you to ask, seek, and knock. As 2018 comes to conclusion, there may still be lingering unresolved issues you still wish to resolve; it’s not too late to take it to Him. 2018 may be over, but God is never over. HE’S ALWAYS THERE: yesterday, today, tomorrow, and forever. Rejoice! For His words has assured you that you’ll receive, and find that which you seek for. Ask with faith, believing, and God in his infinite mercies will grant your request. Previous What do you want?! Next 2019: What do you see? Please absorb the message in this post. Another encouraging post from another great blogger. I felt the Holy Spirit lift my spirits. I’m blessed to have come across this. I’m sure you will be blessed as well. Have a great afternoon. It warms my heart dearly. Well said! Happy new year, may 2019 bring your heart abundant blessings! Amen! Wishing you likewise. Happy New Year to you! Thank you for the well wishes. I wish you likewise…joy, peace, happiness! Etc. Looking forward to this 100 consecutive days of post. Oh yes! I have posted an update.